You daily browse through Facebook and most often, it rarely happens that you miss any big/important update on Facebook. Unlike twitter where its flooded with tweets, Facebook still manages to show you the most relevant updates on top. Have you ever thought, how does it work?? 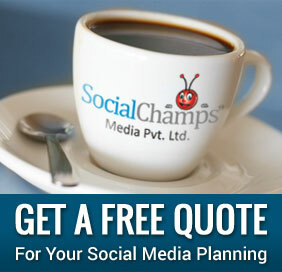 Its been managed by an extensive algorithm of Facebook which is called EdgeRank Algorithm. 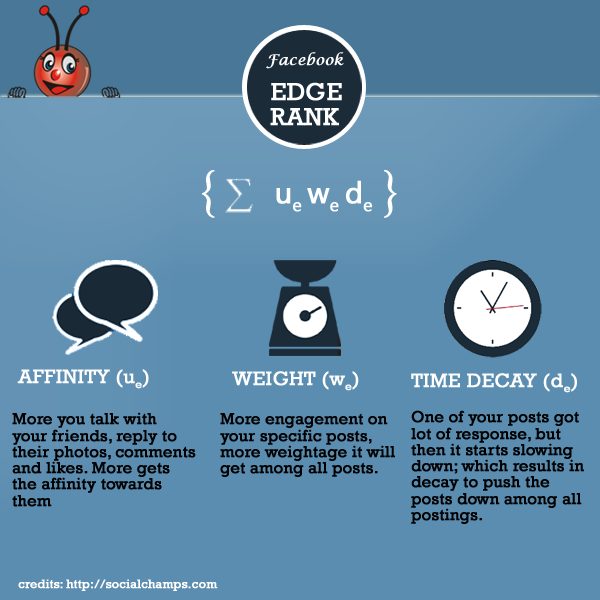 There are three factors used by the EdgeRank algorithm of Facebook to determine what content should be highlighted in your newsfeed and what content should be pushed to the background. In this post we will talk about the ‘Affinity’, so lets discuss this with below example. Lets talk about Jay, a FB user with 100 friends, 10 favorite games and 10 apps that he follows on his FB profile. If each friend and app posted stuff on FB five times a day, Jay would have to sift through 600 updates on a daily basis. This presents an obvious problem for Jay and Facebook marketers. Arranging updates chronologically will push ‘Update no. 589 – an exciting discount offer’ on fitness accessories to the bottom. Jay is a fitness freak you see, and would love to know more. Updates 1 to 120 talk about profile updates made by distant acquaintances. FB will be a productive, entertaining and meaningful experience for Jay and marketers alike only if the right content is highlighted for the right person. Imagine a television with just one channel showing all the shows in the world. Sports, action movies, chick flicks, soaps, music shows, reality TV… everything on one channel. How to ensure the sheer volume of content does not overwhelm you? Simple. Let an algorithm understand your affinity to certain genres and shows. Let it analyze your viewing habits and understand what you like, dislike, would probably like and would not want to see. TV= Facebook. Channel= Newsfeed. Your preferences= Facebook Affinity. Affinity describes the relationship of the user with his or her connections. Update no. 589 will zoom to the top of the list once the algorithm identifies that Jay has a high affinity for fitness related apps, groups, businesses and connections. Like Klout, Facebook Affinity assigns a value to your interactions with different connections and enables the algorithm to identify updates that you might consider important and meaningful. There are different grades of affinity. A profile visit is okay. A comment is good. Multiple comments leading to a conversation will definitely register on the Affinity scale. Submissions, tagging, commenting, photos, videos… there are so many facets and aspects to your relationship with your connections on Facebook. You may have a crush on a classmate and may be too shy to write on his or her posts. Sorry but Affinity will conclude you do not think much about him or her and your Newsfeed may not show updates from your crush. The algorithm is not perfect as it cannot track your perception unless expressed; but then even Google’s search algorithms is not flawless. On the whole, the idea of social interactions determine Affinity which in turn is a factor that determines what shows on up your Newsfeed. The next post of this series will talk about the 2 other parameters of equation i.e Weight and Time decay. So keep watching an eye.